Mini-retirements happen more often than you might think. A classic example is the parent stepping away from the workforce to raise a family – as our client Pat O’Konis did early in her lifelong career with Aetna insurance. Pat and Jim O’Konis started out as high school sweethearts. After nearly 50 years of marriage, they now finish one another’s sentences mid-stream. They also both joined Aetna early on. Pat started right out of high school in 1967 as an office assistant. Jim joined the firm shortly thereafter, “because that’s where Pat was going,” he laughs. His position was supposed to be temporary, since they figured he’d be drafted into the Army. He never was, and his “temporary” gig turned into a 42-year career. Meanwhile, Pat worked for a few years before she became pregnant with their first of two sons. “In those days, you got thrown out after you got pregnant,” says Pat, matter-of-factly. Imagine that! So, while Pat’s mini-retirement wasn’t entirely by choice, she enjoyed raising their sons. But she also longed to return to her career, missing the emotional and financial benefits. After a decade-long break (if you want to call raising two young boys a “break,”) she returned to Aetna, joining their IT department and eventually becoming a software engineer. She retired for good in 2010, with 28 years of accumulated service. 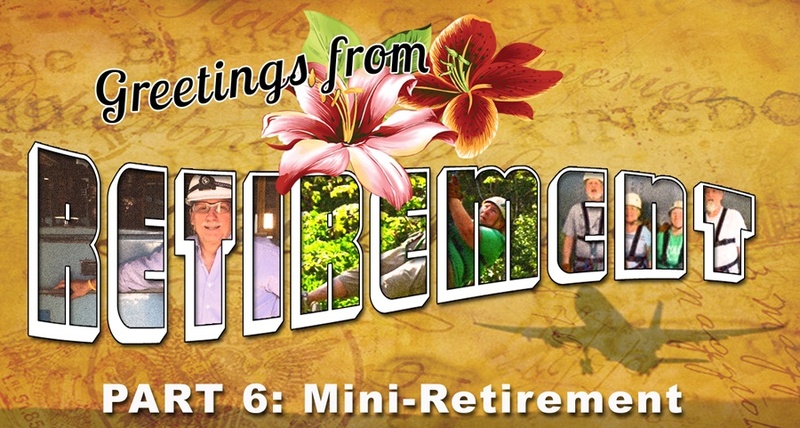 Not every mini-retirement fits this same mold. I know, because my husband Dave Cupo recently completed a mini-retirement of his own. Like the O’Konises, Dave and I met on the job. I was in the GE Financial Management Program at the King of Prussia, PA office in the early ’80’s, and along came this handsome start-up engineer. Sparks flew, and the rest is history. During my own re-careering from GE management into co-founder of SageBroadview, I took a five-year mini-retirement myself, from 1996–2000. I wanted to spend more time with our young sons while I took financial planning classes in the evening and contemplated my next steps towards building a business. Dave continued to advance at GE in roles as a sales engineer, as a plant manager and finally a senior regional manager during his 34-year career. Then, his turn came. “I never didn’t want to work,” says Dave. But when GE offered him an early retirement package at age 58, we took a look at our personal goals, crunched the numbers, and decided to go for it. Dave’s opportunity to take a break from work, spend some meaningful time with our fast-growing sons, help me transition from a home office to an office space in downtown Morristown, and get caught up on our home improvement list … all these things appealed to both of us. Fortunately, Dave found it relatively easy to jump back in approximately where he’d left off after his four-year mini-retirement. 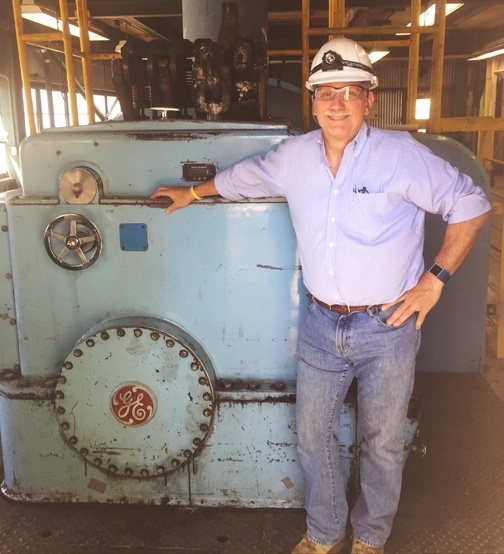 After networking with some fellow former GE colleagues, he decided to re-enter the workforce as an engineering independent consultant, helping firms start or restart their power generators. Much of the work he’s doing today is the same as before (a little like coming back to the same soap opera, he jokes). But there are advantages to the fresh start. For one, his experience has served him well, helping him hit the ground running when he goes on-site. “Since I’ve been in their shoes before, I can relate to everyone on the team,” he says. Even better, he can now mostly set his own schedule. If he wants to work hard, he can. But we were also able to get away this spring to celebrate our 25th wedding anniversary in California wine country – without having to find a babysitter or ask anyone’s permission. That’s a mighty fine feeling! In my next post, we’ll take a look at what semi-retirement looks like, which is the model Jim O’Konis ended up taking several years ago. SAGE Serendipity: Just thought we should check in with this summer’s night sky. 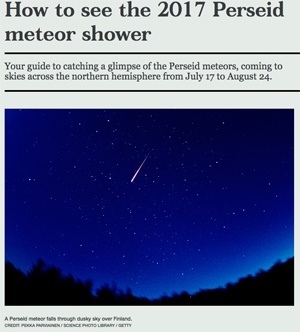 Cosmos Magazine has a guide to…How to see the 2017 Perseid meteor shower. The show has already begun but mark your calendar for August 12 & 13 for optimal viewing.